What would you say is the default/ideal number of players for strategy games? Most people (almost half!) voted that there “is no default/ideal”. That probably sounds like a safe, reasonable choice, but it’s really a pretty bold claim to say that there is no default or ideal – certainly at least as bold as any of the other options. In second place was “2 player”, which did not surprise me. What did surprise me was how close the margin was between “2 player” and “3+ player”, though. I would have expected the breakdown to be more like 40% “unanswerable”, 40% “2-players”, 20% “3+ players” and basically no one voting for 1 player. Actually, I still kind of think that if more people took the poll, it would probably head more in that direction. It’s the furthest thing from a scientific poll, but it’s useful in the sense that it makes pretty clear that just about nobody thinks the ideal number of players for a game is one. The 1% of people who voted “1 player” are likely people who follow my work closely and have already been convinced specifically by my arguments. The poll only asks about “strategy games”, but actually I would argue that with a single exception, the default number of players for any interactive system is one. That single exception would be systems whose primary purpose is to facilitate social interaction. Party games, certain MMOs, or “social experiment” games come to mind as good examples. A designer might also choose to make his or her system multiplayer even though that’s not its primary purpose, and of course, they’re free to do that. My only concern is that they understand the costs, and don’t do so “automatically”, assuming that multiplayer is the default. For now, this article will be attempting to make the narrow claim that the default number of players for a strategy game should be not two, not three or more, but one. To clarify that claim a bit, I am saying that in general, the ideal pattern for getting best results out of a new strategy game would be to design it as a single-player game. For the purposes of this article, I won’t be diving into my interactive forms; I’ll be using colloquial language almost entirely. But as a side note for those who are familiar with my forms, what I say here about “strategy games” absolutely applies to my own Clockwork “game” form. Strategy games are what you’re probably thinking about when I say the phrase “strategy games”: competitive games; contests which you are trying to win. So, not The Sims, Final Fantasy or Everquest, because none of these have meaningful “game loss” states (even if some or all of them may have some “completed/beaten” state). Strategy games also involve some degree of strategy, which is to say “making strategic decisions”. For the purposes of this article, they absolutely can contain things other than strategy, such as execution, a measurement of raw ability, or chance, but they must contain some decision-making. So: baseball, Street Fighter and Civilization all probably qualify here. On the other hand, some systems which are “win/loss” contests, like Dance Dance Revolution, “horseshoes” or an arm-wrestling contest probably do not qualify, since they do not involve strategy. Most strategy games—the vast majority of those which currently exist—are for two or more players. Between team sports, board games, and multiplayer videogames, it’s easy to understand why a person would assume that “strategy games just are multiplayer”. There’s also huge set of cultural ideas that “come with” the idea of a strategy game. The idea of ranking people by skill, as is done in tournaments and ladder systems comes to mind. We often think of strategy games as being a bit of a “practice” for dealing with the challenges of real life, where one must “out-think opponents”. Business leaders and master Chess players have been known to read Sun Tsu’s The Art of War. The actual military sets up strategy “war game” simulations to prepare for actual war. I think this is really why the suggestion that the optimal number of players could possibly be one sounds so ridiculous to people. There’s a thick network of cultural rope-work tying “strategy games” and “human to human conflict” together, and most of the strategy games that exist now are multiplayer. I’ll address both of these before building my argument. Why do we consider strategy games multiplayer? So there are two main arguments here. The first one, and the easier to debunk, is the one that says “single-player can’t be ideal, because most existing strategy games are multiplayer”. The shortest reply to this counterpoint is that it’s fallacious reasoning. Just because most existing strategy games are multiplayer does not mean that it’s ideal to design them that way – there could be all kinds of reasons other than it being ideal design-wise that this is the case. Only for the past forty years have we had computers suitable for game-playing. With computers, it’s possible to design complex generation algorithms and systems that would be unacceptably fiddly if put together with cardboard and other non-computer-materials. Only for the past thirty or so years have we really had a specialist class of game designers who are even asking the question “what would be a more ideal way to design games”. I personally might argue that we don’t even have that now, but we’re at least starting to build the infrastructure for it: there are typically “game designer” roles on a team and game design University programs. Fifty years ago, there was no “game designer” person on Earth whose job it was to come up with great rulesets. So, we’re simply at the beginning of the era of “designed games”, and for that reason it’s really a mistake to assume that “the way we’ve done things is the way we should always do things”. Picture yourself as a person helping to create a folk game, at almost any point in the history of human civilization. Whether it’s in ancient Greece or in the 17th century, involving other players is a very quick and easy way to make a boring system seem kind of fun. You’ve got the socializing element, you have the unpredictability of other human players, you have imagined “reading” patterns, and you have a “ranking”, which is suitable for gambling and creating social status order (as well as getting feedback for your own skill growth, which is a good thing). On the other hand, designing a deep and replayable single-player system is… a pure mystery for you. Doing so now even with a computer is hard; trying to do it without the help of a computer is incredibly difficult. As to the question of why we have such a strong association between strategy games and multiplayer… I honestly feel like the fact that we’ve had such a long history of most strategy games being multiplayer is enough to achieve that. We’ve never really understood – or even tried to understand – what strategy games (specifically) are. So it makes total sense that we would think that strategy games are a metaphor for war, or for love, or for adventure. And if you think they are, then you shouldn’t be afraid to ask: but, are they really? I believe I have isolated the fundamental properties of a certain kind of machine. It is a machine which arranges its information in such a way so that a user may make inputs to the system and receive meaningful feedback about that system. The user is attempting to reach a certain state – the “win” state – and makes inputs that he or she believes will lead the system closer towards that state. The machine is sufficiently complex so that it is not only not “solved” when you win (as is the case with a puzzle), but it is not solved even after many, many plays. Further, the complexity is not just a matter of brute force calculation, because some of the information is hidden. Because of this, the player is forced to make reasonable conjecture about what might be a “strong” (gets you closer to the win state) move. At some point, the system reaches an end state which resolves to either the win state or the loss state. In either case, this state acts as the foundation bit of feedback which positively or negatively charges the course of events that led to this outcome. In a well designed machine of this type, the final state and every state before it delivers a new set of data for the player to experience and analyze. We want to see, “did we make a new, correct hypothesis about this system and how it works?” You could think of each completed “match” as a new experiment testing that hypothesis. That all might sound a bit esoteric, but I think that actually that’s the core of what’s happening when we play StarCraft, League of Legends, Chess or Through the Desert. In other words, the machine I’ve been talking about is “the strategy game”, in its most elemental explanation. This does not mean that strategy games can not have other totally unrelated things going on as well, like social elements, random elements, execution elements – it just means that at their core, this is how they fundamentally work. If this is the case, we technically do not need more than one player, which itself is a decent argument for “1-player” being at least the default arrangement for a strategy game. A single-player game can absolutely do everything that’s fundamentally necessary, at least. Even having a healthy information horizon, the randomness will affect final outcomes somewhat, so designers need to work hard to make sure that their random information is as balanced and “fair” match to match as possible. Without doing this, players will be in a situation where they must play many matches waiting for “ideal random results” from the generator. I’d say this is quite the case in many Rogue-like games now – beating your “high score” is highly dependent on the random effects that happen in the game. For Auro, I worked very hard for years to make sure that every match (at a given rank) has roughly the same difficulty level specifically so that every match “matters” and none are throwaway “easy wins” or “brick walls”. In a multiplayer game, the input that other players make is effectively random. You can make predictions about what another player will do based on valuation, move history, or even extra-game information (like “they made a funny face when they played that card”), but ultimately, you don’t know what they’re going to do. They could just not do the thing you predict, and this is especially the case in competitive strategy games, where often being unpredictable is itself advantageous. If you have a well-placed information horizon, that player randomness is mostly OK; random is random, right? Well, no, actually. Player randomness is erratic and hard to control. What you probably want is some degree of “uniformity” to your randomness if you want fairness, but players will do all kinds of strange odd-ball behaviors, some of which will swing games wildly in the direction of an easy win or a brick wall loss – in either case, a weird outlier that doesn’t really reflect the performance of the player. We can all think of that time that we did some really dumb move in Chess and threw the game. Even if players do this super-rarely, a well-crafted randomness algorithm will never do that, and so it’s preferable. You could argue “well, can’t a one player game also have that problem?” It’s true that even a single-player could make some really dumb move and throw a match. However, that’s unavoidable as far as I see it, and adding more players only makes this problem worse. In a single-player game when you screw up, you’re only messing up your own game. 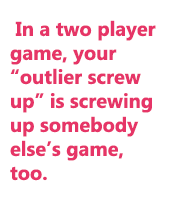 In a two player game, your “outlier screw up” is screwing up somebody else’s game, too. That may not be a huge deal, but it is something bad that can be minimized by making the game single–player. I should make a quick mention of use of “AI” in games. The answer is never to simply build a multiplayer game and then just have AIs take control of each player’s spot. The practical and simple answer to why this is not a solution is that AI in this way is a simple puzzle that you lay on top of the game. So in practice, players actually don’t need to improve at your game if they can just exploit the weaknesses in the AI, and this is time and time again what happens. I talked more about this issue in this podcast episode. Another nice thing about making a game single player is that you can exactly fine tune your generation algorithms to not only never “screw up” and throw a match, but to be far better from the perspective of the player than the input of a second player could be. Players are primarily motivated to make good-for-me inputs – inputs that place them in the best possible situation in terms of winning the match. But there’s another axis, which is “good for the system”; meaning, inputs that will make the system work better, be deeper, more interesting, and so on. While a well designed two-player game will make efforts to try and make the best move for me also be a good move for the system, an algorithm gives the designer more control over exactly what the parameters will be for optimal “game health”. The algorithm does not care at all about “winning” over the other player – it only is concerned with (if programmed properly) making the game function as best it can. This, by the way, is why I tend to object to single player as “player vs. the system”. Actually, the system is working with you to give you the best, most effective game experience possible. For a game with three or more players, you also have a kingmaking problem, where inevitably a player who cannot win will be making decisions about which of the remaining players will get to win. That is, at least, how the kingmaking problem is typically described. I think a better way to describe the problem is that for one or more players, the game continues even after the match has become unwinnable. The fact that that core purpose, that goal, has been stripped from them, the system now has failed to function and inputs have no meaning. So what players think of as a “kingmaking” issue is actually just a symptom of this much larger problem. I can’t imagine a three-or-more player game wherein you wouldn’t have the situation appear that victory becomes out of reach for one player, unless that game’s game states were so swingy/random as to be meaningless. A possible answer is “player elimination”, but that can have practical costs (a player potentially having to sit around and wait for a game to finish). Either way, even if one could find their way around the kingmaking/lame-duck issue, the aforementioned issues still affect 3+ player games. I want to be clear in saying that I do not think it’s some “huge problem” for games to be multiplayer. Certainly, many great multiplayer games will be created. But it’s worth knowing that all else being equal, single player is overall preferable. In order to make a single player strategy game work long term, you will need some kind of dynamic difficulty adjustment (just as multiplayer games need either a matchmaking system or a consistent opponent who is capable of growing at the same rate as you will). I’ve implemented such a system in Auro, and I’ve also seen some digital board games with similar systems, but the fact is that single player strategy games are shamefully rare overall. Most systems that would otherwise qualify as single player strategy games sadly lack a clear enforceable goal – Rogue-likes or so-called “puzzle games” like Tetris come to mind. Most single player strategy games are plagued with a “high score” system instead of a clear, enforceable goal. High score, which I see as a vestigial design trope originally found in Pinball machines and rarely questioned since, makes little sense when looked at as a “goal”. Is 1 point a “high score”? How do I know whether my score is a “high” one? Looked at this way, “get a high score” is not a goal any more than “play the game really well” is a goal. Match lengths tend to scale indefinitely. This means the game can not be designed around a certain match length; “match structure” can’t really be utilized to increase depth. As you get better at the game, game length increases to non-optimal lengths, punishing players for having gotten good at the game. Let’s say you are playing, and your previous highest score was 50 points, and you just got your 51st point. Now what are you doing? You’re back to the “get a really high score” idea, whatever that means. An argument could even be made that it is perhaps optimal to end the game immediately upon getting that 51st point, so that future games won’t be as hard? As I said, you can absolutely make a great multiplayer game, and you may have good practical, social, cultural or business-related reasons for doing so. However, it’s unlikely you will have a good game design reason for doing so, since as far as I can tell, while the costs are small, there are no game design benefits at all to making your system multiplayer. From what I can tell, there is not a ton of work being done to work on this problem of producing interesting, deep single player strategy games. I was inspired by the single player versions of Uwe Rosenberg’s Agricola and Le Havre to really start looking into this issue. I’ve also noticed in general that many Eurogames – which are often some of the best-designed games in existence – seem to want to be single player games. Beyond that, you have a few designers working on games like James Lantz’ Invisible Inc. and Michael Brough’s new Imbroglio. I also must make mention of Reiner Knizia’s Labyrinth (which, don’t worry, is not the children’s toy of the same name wherein you tilt a maze to lead a ball to a hole). I can absolutely understand the desire to want our games to be social. I want that, too. But I think it’s worth knowing that inherently, games are not social, in the same way that inherently, art and science are not social. We can exchange ideas, talk about our experiences, and show each other observations, but at the lowest, most fundamental level, it’s just “a human brain attempting to understand a system”. As always, it’s a matter of making a cost-benefit analysis. It very well may be worth the small cost of making your game multiplayer. I just want people to understand that it is, even if just slightly, a cost. With that cost in mind, maybe more strategy game designers will take single-player more seriously as a real option. Enjoyed this article? Consider supporting my articles, podcasts, videos and games at Patreon.com.